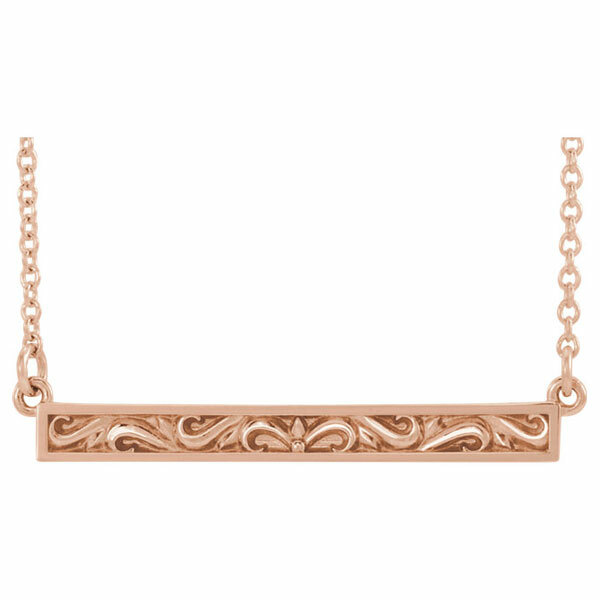 If you love the look of rose gold, you will adore this 14K rose gold paisley scroll bar necklace from Apples of Gold Jewelry. 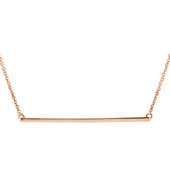 The bar necklace, which is made from 14K rose gold, features an 18" chain attached to the sides of the bar pendant. The bar pendant itself measures just under 1 1/8" wide by 3/16" tall, and features a raised, plain border around the outside, with a paisley design on the bar pendant's recessed interior. This gorgeous necklace offers a refreshing look on plain bar necklaces and is sure to help dress up any occasion! We guarantee our 14K Rose Gold Paisley Scroll Bar Necklace to be high quality, authentic jewelry, as described above.